What should I practice outside of class? So many people are afraid to practice yoga outside of a class setting. Home practice shouldn't be that intimidating. Just practice what you have learned in class. Repeating one standing pose several times for 5-6 minutes, everyday will reinforce the actions in the body. The actions that are learned in the basic standing poses will make the advanced poses much more accessible. Let’s take Utthitta Trikonasana - extended triangle pose- a basic standing pose that is taught in every beginner class and it seems like nearly every class after that. There are many actions in this pose that if learned properly will make inversions and hand balances effortless. Think about the front leg, extending from the upper thigh through the big toe and big toe knuckle grounds the leg and create stability in that pose. When that same action is applied to inversions or arm balances it brings life and ease to those poses. Extending the inner leg through the big toe knuckle lifts and brings lightness to Sirsasana - Head Stand and drives the lift in arm balances like, Eka Hasta Bhujasana - One arm/shoulder pose. There are a few essential actions that I like to think of like learning scales in music. Once you have practiced the scales the compositions come more easily. That is why the standing poses are so important and taught often, so why not practice them often. Plus, standing poses can be done about anywhere, hotel room, balcony or beach. Travel doesn't mean you should skip your daily practice. Practicing standing poses over a long time, for weeks, months, years, also enables the mind to penetrate the pose. After all that is the reason for practice to penetrate the mind. When you just cannot think of what to do for your strong daily home practice consider standing poses. The "Narrow" Bolster, 6" smaller than the Skinny Bolster. Great for putting between knees when sleeping or during pregnancy. Could also double as a Pranayama Pillow. 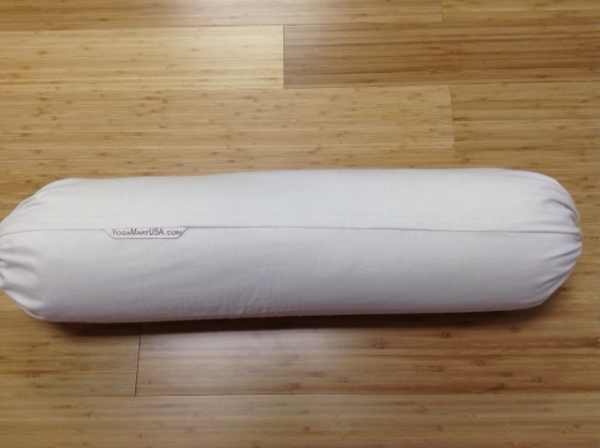 Special price on new "Narrow" Bolster - $48 - for one week only. Offer expires August 7th. 1.2 yogah cittavrtti nirodhah - Yoga is the cessation of movements in the consciousness.